cake with the queen at PARF. 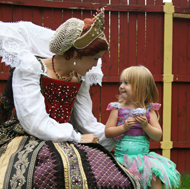 Children who look forward to eating birthday cake with the Queen at the Pennsylvania Renaissance Faire will not be disappointed this year. 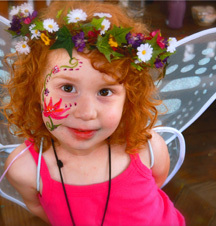 The faire will be open as usual having suffered only minor damage and flooding from Hurricane Irene. Candice Smith, media manager for the faire, said that there was some minor flooding and one large tree was downed that has to be removed. Other than that the damage was just debris that would be cleaned up quickly. The faire was closed Sunday, August 25, because of fears that the storm might wash out roads and strand people at the faire. All the workers were told to stay home except for the animal caretakers. The horses were kept safe in the barn during the storm and the elephant stayed in his own air-conditioned trailer. The Pennsylvania Renaissance Faire is 80 miles west of Philadelphia near Manheim. PARF runs now through 10/30/2011. Photo by Jody Anne Oliveri. The New York Renaissance Fair near Tuxedo, NY, only 40 miles north of Manhattan, had to shut down early on Saturday, August 23, in order to fortify the grounds. They had about one thousand patrons on Saturday and the organizers were worried about their safety as well as that of the merchants and performers. After they left, the faire workers took down tents and hanging signs and secured the larger buildings and shops before leaving. The horses were moved to a safe barn 3 hours away. The site manager took the precaution of turning off the electricity to the site before the storm hit. Irene passed through overnight leaving felled trees and flooding. According to Wanda Carr, NYRF marketing manager, the pond overflowed and flooded only one office building. No one was hurt and the electricity was only off for about 6 hours. The faire will be open as usual, including Monday Labor Day. This weekend is Fantasy Weekend and next is the Barbarian Invasion. NYRF runs through 9/25/2011. Opening this weekend, the King Richard's fair was less impacted by the hurricane than other fairs that were already up and running. "We will open on time," said Minda Gown, marketing director for King Richard's, "We faired very well. No structural damage, no flooding. We are in the pines so we had a lot of downed branches and we lost power on Sunday." 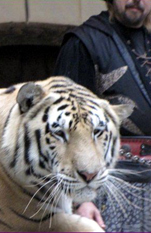 She went on to say that none of the show's horses or big cats were on site, so they were never in danger. Gown said that many people were already helping to get the fair ready for opening and they just switched to storm readiness mode. "Being from Carver, Massachusetts, we are always prepared for the worst. We even had generators for the kitchens to keep the food fresh." King Richard's Fair is celebrating it 30th anniversary season this year. KRF is located in Carver, MA less than 10 miles from the coast and 50 miles southeast of Boston. KRF runs weekends plus Labor Day from 9/3/2011 to 10/23/2011.